Turn your mobile into DSLR Camera easily, everyone can be a photographer of your life! You cannot always hold a big size camera in a party, on a hangout, or on a get-together party where you need to capture selfies with your family & friends, cell phone camera lenses are new to the market. 112° Super Wide Angle Lens is ideal for group shooting , which can hold larger group of people in one photograph perfectly. Recording Every favorite moment for you, your Friends and Family. Explore the extreme tiny world, the macro lens is a fantastic lens that allows you to take a closer look at this wonderful world, it's perfect for close-up shots of stamps, jewelry, coins, fabrics, and more. Make sure your Smartphone camera in the center of YOUMILE lens. Please wipe clean all lenses before using. The Flash Light might be blocked when using the lens. You had better take off your phone case for taking better photos. When you are going to use the wide angle lens, please screw the macro lens together with it. The cell phone camera position get a distance less than 2.5 cm to the phone edge (the closest to the edge of the phone) . 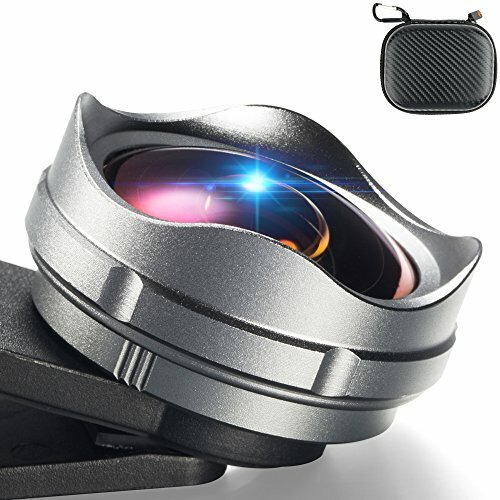 【Smartphone photography professional equipment】Forget the heavy cameras and lenses, this portable 2 in 1 Smartphone camera lens better for you. Take it with you anywhere you want. 【PROFESSIONAL 2 IN 1 KIT】 112° Super Wide Angle Lens & 15X Macro Lens. With the 112° Super Wide Angle, it can help largely expand the field of view and enable you capture the entire family or a whole team member into one picture, 15X macro lens can take clear photos of extreme tiny world. 【OPTICAL TEST 112° WIDE ANGLE】Professional optical test YOUMILE phone lens wide angle is 112°. And it is maximum wide angle without any distortion. Any other sellers describe their wide angle lenses over 120° are false. 【HIGH DEFINITION and DURABLE LENS】 YOUMILE phone lens is made of glasses with multilayer purple optics coating, High transmittance of 99.5% make your picture more clearly. Professional HD camera lens reduces glass flare & ghosting caused by reflections. High-quality aluminum alloy material enhanced durability, will provide years of use and enjoyment. 【TURN YOUR MOBILE INTO DSLR CAMERA】Just grab your phones, place the cell phone camera lens with the attached clip and there it is ready to be used. Photography has never been this easy. Now give a sharp, crisp and delightful experience to your photographs. Enjoy the high-quality technical image effect, WITH IT, your world, not just so big. If you have any questions about this product by YOUMILE, contact us by completing and submitting the form below. If you are looking for a specif part number, please include it with your message.